Are you looking for your own Florida place to call home whether you are seasonal or a year rounder? This home comes furnished with some exclusions and even includes the golf cart. There is a large shed with double doors (so you can fit your golf cart in there if you need to store it) and a single door so you can access the washer/dryer. There is a long driveway with carport where you could possibly fit two or three cars. Per the seller the air conditioner was replaced in 2015 and laminate flooring was installed over plywood subfloors. There is a pass through opening between the kitchen and living room with tri fold shutters so you can leave it open to feel an open concept or close them if you're focused on cooking that fantastic gourmet meal. 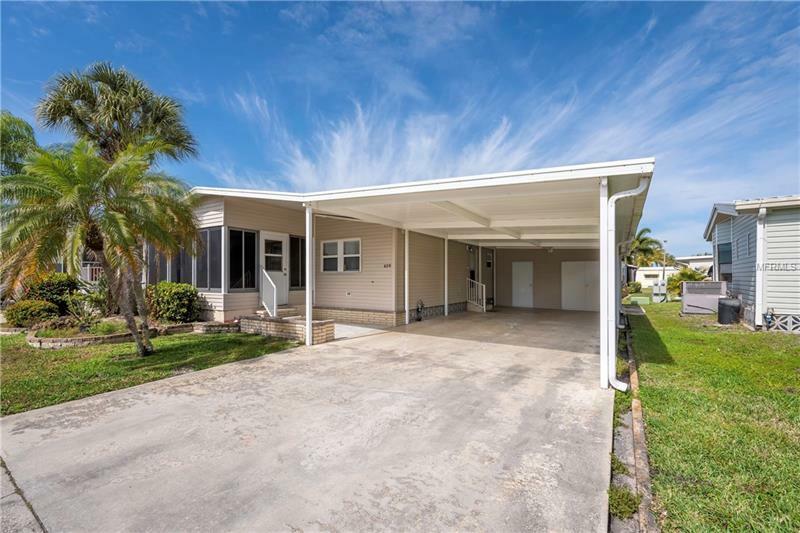 The home has a front enclosed lanai where you can enjoy the comings and goings in your neighborhood. There are 2 bedrooms and 2 baths plus a galley kitchen with a pass through window to the living room. Home price includes $40000 membership certificate/share. Located in an award winning resident owned 55+ gated golf course community with an active resort lifestyle. Features a par 62 golf course 5 tennis courts bocce ball lawn bowling 2 shuffleboard courts 4 heated swimming pools 2 hot tubs fitness facility woodworking facility 75+ clubs/activities 2 pickleball courts restaurant with full service bar and more. Sorry no dog allowed at this interior lot location. Gated community. No CDD tax. It's all about the lifestyle in Maple Leaf.